Many of you may have noticed the appearance of a few wild turkeys in Shorewood. Read the link for more information. Many of you may have noticed the appearance of a few wild turkeys in Shorewood. Although this hasn’t been a common sight in the past, it is not unusual for turkeys to take up habitat in urban areas. As these birds become acclimated to humans and traffic, they can become a bit of a nuisance. Unless the turkeys are actively attacking a human or a pet, the police department will not respond to remove them. These are wild birds and the police department lacks the authority to simply remove them because you don’t want them near your home. While turkeys are intimidating and can be agressive, they are virtually harmless. Show dominance over the turkey by making loud noises or shoo them away with a broom. We have been informed that people have been feeding the turkeys. Please do not feed them! They will not leave if they have the comfort of food being given to them. Here are some tips on how to peacefully cohabit with the turkeys. ■Don't feed turkeys. Keep wild things wild! Feeding, whether direct or indirect, can cause turkeys to act tame and may lead to bold or aggressive behavior, especially in the breeding season. ■Keep bird feeder areas clean. Use feeders designed to keep seed off the ground, as the seed attracts turkeys and other wild animals. Clean up spilled seed from other types of feeders daily. Temporarily discontinue feeding birds if turkeys are a nuisance. Remove feeders in the spring, as there is plenty of natural food available for all birds. ■Do not allow turkeys to be comfortable in the presence of people; chase turkeys away from your residence. Don't let turkeys intimidate you. Don't hesitate to scare or threaten a bold, aggressive turkey with loud noises, swatting with a broom or water sprayed from a hose. A dog on a leash is also an effective deterrent. ■Cover windows or other reflective objects If a turkey is pecking at a shiny object such as a vehicle or window, cover or otherwise disguise the object. Harass the bird by chasing it, squirting with a hose or other means of aggression. ■Protect your gardens. You can harass turkeys searching for food in your gardens. 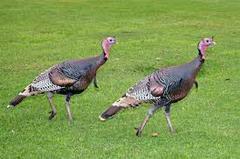 Dogs tethered on a run can also be effective in scaring turkeys away from gardens. Netting is another option to employ. ■Educate your neighbors. Pass this information along: Your efforts will be futile if neighbors are providing food for turkeys or neglecting to act boldly towards the birds. It requires the efforts of the entire neighborhood to help keep wild turkeys wild. Turkeys are important and valuable birds in Wisconsin. They are classified as game birds for which regulated hunting seasons and management programs have been established. If you are experiencing problems with turkeys or have any questions regarding them, contact your nearest DNR Office.